Update: 10/21/16: This was my favorite feature in the Android N developer Previews, however, for whatever reason, this was removed. Well, I am so excited when I received my Pixel Phone, to see this feature was brought back. 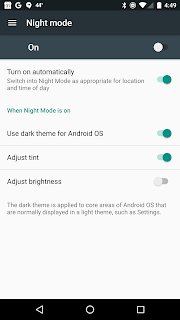 The feature was renamed to Night Light and essentially has the same functionality as before. 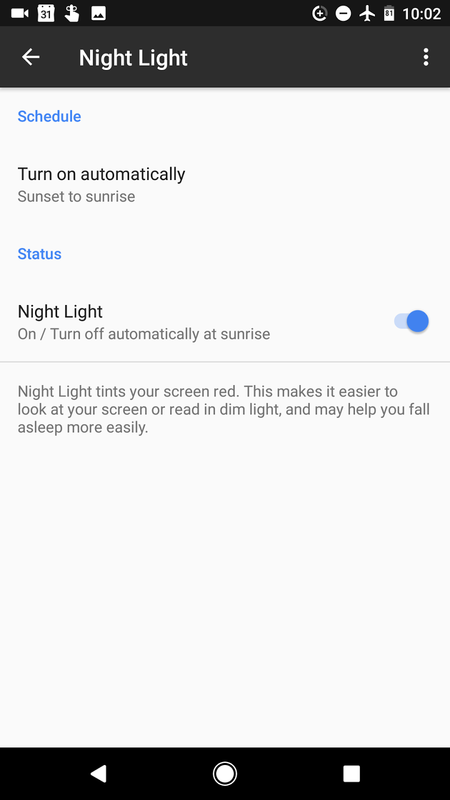 You can set custome on/off times, manually turn it on, or have it automatically turn on/off a sunset/sunrise based on your location. Hope you all are as happy as I am that this was brought back. 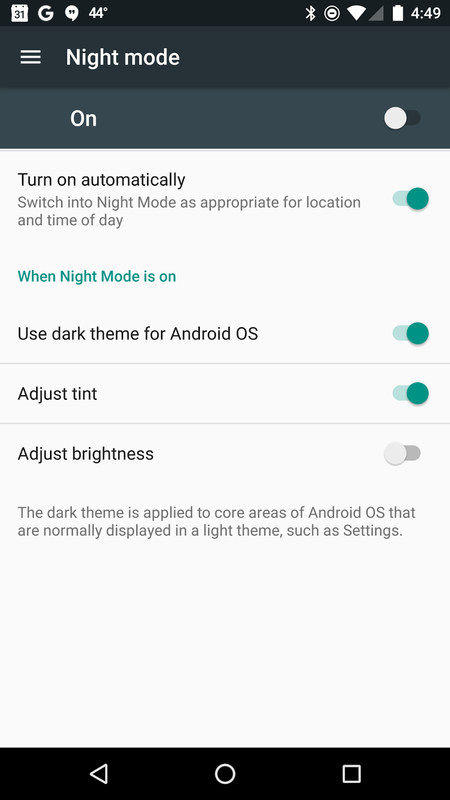 A new feature in Android N Developer Preview that is being well received is the addition of the night mode feature. 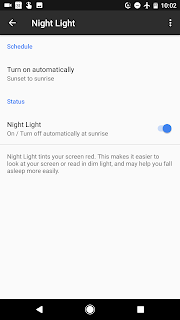 This feature essentially makes the device much easier to see at night by giving a red hue to everything. 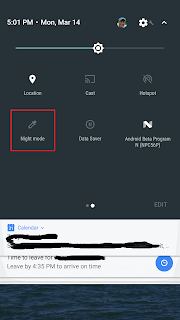 Its a nice feature that can be turned on and off right from the system shade drop down. What is even nicer is you can set it to turn on automatically based on your location settings and the time of day. In order to set this up, you first need to have System UI Tuner activated. To turn this feature on, simply pull down the notification shade and press on the settings gear icon for about 4 or 5 seconds. When you let go you will be shown a congratulatory message letting you know that System UI Tuner has been activated. Now when you go into the settings menu,, towards the bottom you will have a new option called System UI Tuner. Now that this is enabled, click on it and enter the tuner to choose your settings. 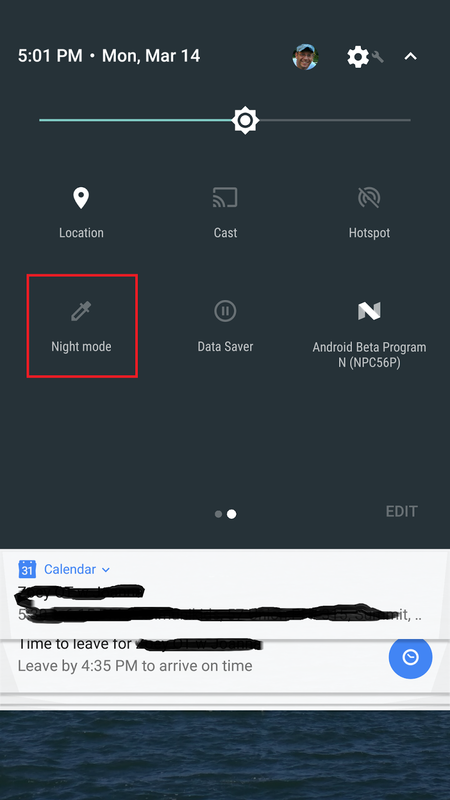 In order to enable the auto Night Mode feature, click on Color and appearance, then Night Mode, and toggle the Turn on automatically setting. You can also change the tint, brightness and dark theme, although I have not found a need to play with any of those other settings.